Google recently updated its AdWords Keyword Tool, showing you, for the first time, the approximate number of searches for a keyword in a given month. The translations come from the CBA Bible Translation Bestseller List. (CBA is the Christian Booksellers Association, a Christian-retailing industry group.) This list counts Bible sales through most Christian bookstores in the US. However, it’s an imperfect measure of a translation’s popularity since sales through non-CBA stores are becoming more important to Bible publishers. The imperfection of the CBA list (and the desire to quantify its rankings) was the inspiration for this (also-imperfect) project. Bible version abbreviations that also have other meanings were a little tricky. “HCSB” is also the name of a bank and a school board in Florida. “ESV” is also a Cadillac and the stock symbol for an oil-drilling company. To compensate for these other uses, I took the top three non-Bible keyword phrases and compared the numbers for the top-three Bible related keyword phrases. For example, there were 90,500 searches for “esv” in June. 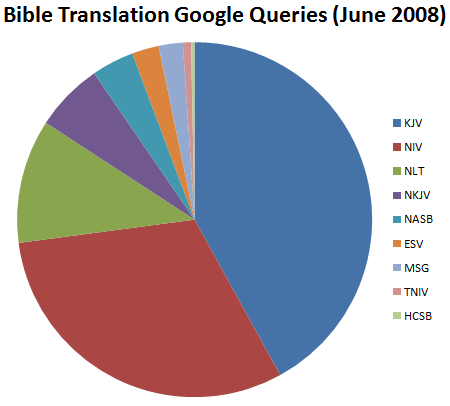 The keywords “escalade esv,” “cadillac esv,” and “cadillac escalade esv” had 57,300 searches, while “esv bible,” “esv online,” and “esv study bible” had 13,300 searches. Multiplying 90,500 by 19% (the proportion of the top three Bible-related searches to the top three non-Bible-related searches) leads to the conclusion that about 17,049 of those 90,500 searches for “esv” were Bible-related. It’s definitely an approximation, but the alternative was to count acronym-only searches for some translations and not for others. Besides the ESV and HCSB, other Bible-translation acronyms have a few other meanings, but they don’t suffer from nearly the level of acronym confusion as those two translations. The HCSB also goes by the name “CSB,” which makes things even harder. Nothing Bible-related showed up when I entered CSB into the keyword tool, so I didn’t count it. A similar problem occurs for the phrase “king james”—with 301,000 searches in June, it was the single most-popular translation-related query. But are the searches for the Bible translation or for, say, King James I of England? Based on the popularity of the related keywords, it looks like 97% of “king james” searches are for the Bible. This query puts the KJV well ahead of the NIV in popularity. The Message also probably suffers from undercounting, since it’s impossible to know how many people searching for “message” are looking for the Bible (not too many, based on the Keyword Tool’s data—but definitely some). Here are the words and phrases I started with. I included other clearly relevant synonyms in the total. You are currently browsing the OpenBible.info Blog blog archives for July, 2008.